Last year when my mini lap top broke, I decided to get an iPad and use it for everything: social media, email, drawing and blogging. Blogging on an iPad was by far the most challenging. But eventually I got used to it. Here are a few tips I can share with you to make your blogging experience better if you too have decided to ditch the computer. 1. Get a Magnetic Smart Cover that turns into a stand. I got mine on Amazon. This will help you have your iPad up as you type. 2. Speaking of typing. A Bluetooth Wireless Keyboard is a must. At first I thought I can use the iPad screen keyboard, but let’s get real. It’s annoying. And I didn’t learn to type for nothing, ha ha ha. It makes life much easier and gives you the feel of having a laptop. 3. I miss my mouse! Yes I do miss my mouse, mainly for editing. It takes a little getting have used to use your finger to scroll up and down a screen. A tip that I can share is that when you feel that your finger is too fat and can’t get to the right spot in your text that you are trying to edit, use your up/down/left/right arrows on your keypad. You would get through your editing much easier. 4. Don’t feel that you have to use the mobile version of WordPress or whatever platform you are using to blog. Remember you can open Safari and go to the full site. I didn’t realize this for the longest time and couldn’t figure out why WordPress was switching looks on me. I am not that techy, but I am learning. From time to time I admit, I sneak and use my husband’s laptop. There are some things that are easier on a computer than an iPad. For example: posting a class on Skillshare. I haven’t figured out how to do that on my iPad yet. 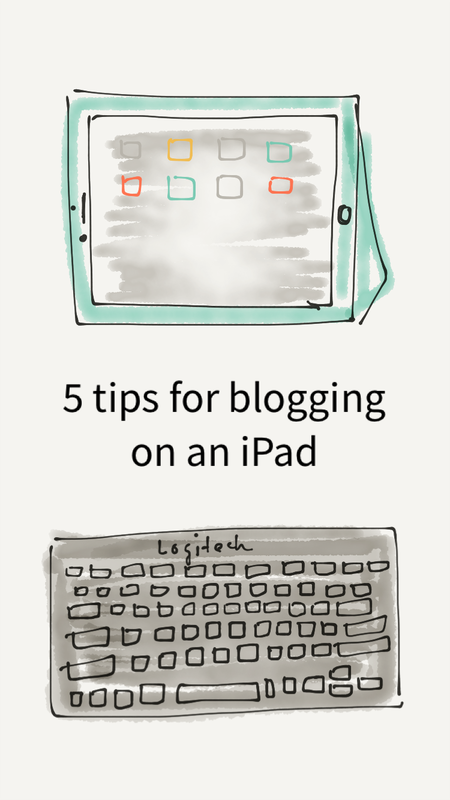 If you have a blog and you are using an iPad, I’d love for you to share your tips.